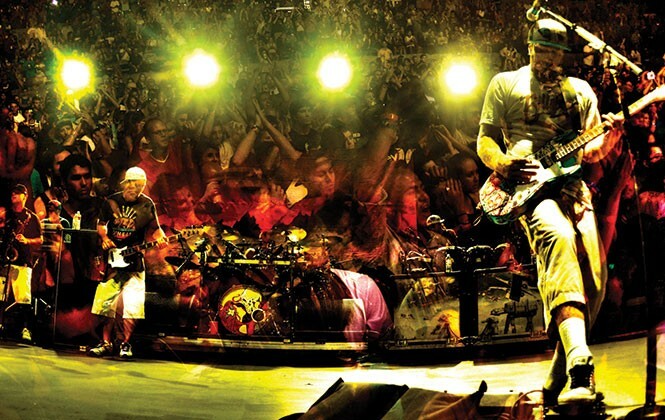 After 20 years together, Slightly Stoopid continues to grow while sticking to their roots. Slightly Stoopid is one of those rare bands who have chosen hard work over cheaply won fame, persistence over instant gratification and a more natural sort of green over the other. And now, at around 20 years strong, they show no signs of slowing down, giving in or selling out. The band was founded in 1994 by childhood friends Miles Doughty and Kyle McDonald, a pair of surfer-skater dudes who got distracted by music, learning guitar and bass. With original drummer Adam Bausch, the trio began playing punk and ska in small venues around Long Beach, Calif. In 1995, they crossed paths with Miguel Happoldt, co-founder/producer for Skunk Records, and his partner Bradley Nowell, lead singer of Sublime. Doughty and McDonald struck up a friendship with Happoldt and Nowell, who signed the band—whose members were still in high school—to their label. This recording session yielded Slightly Stoopid's debut album, Slightly $toopid (Skunk Records). Released in '96, it's a punk-rock meditation on what it means to be young and have a penchant for speedy, aggressive expression. They spent the next several years on the road, living—in a style befitting their Long Beach lifestyle—out of their van. "That's how things started early on," says drummer Ryan "RyMo" Moran, who joined Slightly Stoopid in 2003, prior to recording the band's fourth album, Closer to the Sun (Reincarnate/Imusic). RyMo first saw his future bandmates play in 1996, and got to know them from the local club circuit. In 2002, SS took RyMo's old band the B-Side Players on tour, and a year later, Doughty and McDonald offered RyMo the drum stool. With RyMo's multi-instrumental background—variously playing piano, violin, trumpet and drums while growing up—and musical education from San Diego State University, he was Slightly Stoopid's missing puzzle piece. Now, with eight studio albums, four live albums and an EP under their belt, Slightly Stoopid is an octet. The base trio of Doughty and McDonald (sharing bass, guitar and vocals) with RyMo on drums is buttressed by percussionist Oguer "OG" Ocon, keyboardist Paul Wolstencroft, trombonist Andy Geib and Daniel "DeLa" Delacruz, plus unofficial eighth member Karl Denson (Karl Denson's Tiny Universe, The Rolling Stones, Greyboy Allstars) on saxophone. The expanded band enabled Slightly Stoopid to more easily diversify their sound. "The musicianship is really good, and all the guys really practice and study music," RyMo says. "We went from being a punk and ska trio to now being able to play reggae, funk, rock and world [music]." It is little wonder that Slightly Stoopid's list of influences has grown to encompass greater diversity. "Fishbone is a huge influence, Operation Ivy, Rancid, NOFX, Bad Religion, Pennywise, Bad Brains, Led Zeppelin, Radiohead and Rush," says RyMo. "As far as reggae stuff: Daniel Reed, Bob Marley—of course—and Toots and the Maytals." Listening to Slightly Stoopid, the aforementioned greats' impact on their sound is clear—but they're not simple copycats. "As a musician, you learn how to emulate what someone is playing, then you forget all that and play it your way; that's really the best way to learn things. You find your own musical voice; you put your own personal stamp on it." The band isn't shy about another well-known, not-exactly musical, influence: weed, which, in many ways, contributed to Slightly Stoopid's development. "For us, smoking has always been a lifestyle thing, and it's natural that we sing about it," RyMo says. "It does take you to a different place, mentally, where you can channel different avenues in your brain and open new doors to your creative side." Ganja's skunky stank is all over the band's latest album, Meanwhile...Back at the Lab (Stoopid Records, 2015). It's the band's most sonically diverse and technically mature release to date, an effortless concoction of punk, folk and reggae. And for those "Stoopidheads" out there, there's more in store. "About a month ago, we went up to [Grateful Dead guitarist/vocalist] Bob Weir's studio, and we did a live webcast for a DVD," says RyMo. "We played with Bob, Angelo Moore from Fishbone, Chali 2na from Jurassic 5 and Don Carlos, the great reggae singer. We also have an upcoming collaboration with professional skateboarder Danny Way ... a punk-rock album to be released with a skateboard, and all the proceeds will go to charity." Both projects are looking at late-2016/early-2017 release dates. In the meantime, Slightly Stoopid will continue doing what they've been doing for the last two decades: touring and keeping people dancing. RyMo finds satisfaction in that, and the overwhelming support of their fans. "The fact that we are still doing it—that's success for us. I'm glad we didn't take the one-hit wonder route."